One of the useful tools that Windows offers is the ability to assign drive letters to the network locations. 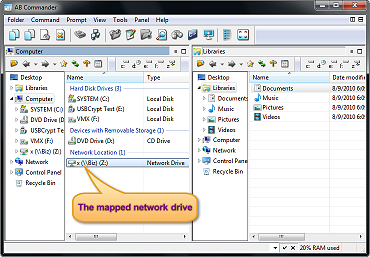 You can use the Map Network Drive command of Windows Explorer or AB Commander to create the network drives. After a network drive has been created, you can use it just like any other drive: browse its contents, copy file to or from it, and so on. (You can recognize that AB Commander is running as administrator by the presence of the Administrator label in its title bar). To understand why the network drive is not visible to the programs running as administrator, we have to consider how Windows handles the standard and administrator user access internally. In simple terms, when UAC (User Account Control) is enabled, Windows creates a split personality for your user account: one with the standard user’s access rights to do the the regular tasks, and another one with the full administrative access to the system. When you log in to the computer, Windows tries hard to create the impression that these two personalities are the same: they share the login name and password, the desktop and documents, settings and preferences, and so on. However, when it comes to mapping the network drives, Windows prefers to treat them as separate accounts (for security reasons). That’s why the network drives created when you wear the hat of the standard user do not automatically become available when you put the administrator’s hat on. This Microsoft article explains it all in detail. Such behavior is rather counter-productive: after all, the administrator account is supposed have more access to the system, it’s supposed to be able to see and do all things that are available to the standard user, plus some more. Why can’t it see the network drive created by the standard user? Caution: If you are not very experienced with Registry Editor, please be extra careful: it’s a powerful tool that can do a lot of damage to your system if used carelessly. After you’ve added the EnableLinkedConnections value to the Registry, restart the computer, and after that the network drives you create should become available to the elevated applications, as well. If this error creates a problem for you, then it’s better not to use the EnableLinkedConnections registry fix at all. Instead, just create the mapped network drive twice: first time using a standard user’s account, and the second time using an administrator account. Sure, it’s twice the work, but it should work correctly in all situations. Perfect. That fixed my problem. Thanks for the clear explanation and solution! Awesome fix. 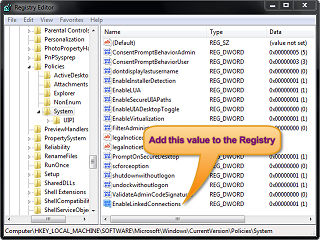 Is it at all possible to edit that registry key from a built in Win8 configuration/option screen? Or for now it’s only manual? PROBLEM: Running a SETUP program which looks for server installtions on mapped network drives, and it was NOT finding any of the network drives. So simple and easy! Thanks for saving me lots of time! This was driving me nuts. In my OpenFileDialog box, I could see all of the network drives in WinXP but not when I ran the app in compatability mode (as administrator) on my Win 7 box. Your registry key solved my problem. Thanks! This new regkey does the trick, but what I cannot figure out is what was allowing it to work before. Just built a Win8 Pro 64 load for my laptop and desktop, similar findings. Mapping the drives as admin and a local user with Win8, will have to try that. EXCELLENT find and fix, I looked quite a while for this one! THANKS!!! Just a note that Microsoft released a hotfix the corrects EnableLinkedConnections not working correctly with Windows 8 with KB 2878604. Actually, XP did suffer this connection-loss issue if you ran as a limited user. Windows 2000 was the last Microsoft OS to not suffer from it. You might find our softwarepolicy applet on sourceforge a better alternative to UAC for LANs. As well as not suffering the share disconnection problem, it is less vulnerable to the social engineering tricks which are the main weakness of UAE. Presently it has one or two minor operability issues with Win8.1, but a new release is in the pipeline. Another point worth mentioning is that EnableLinkedConnections only works for elevation of the same account which created the mapping, it does not work for other user accounts, the system account, or the real Administrator account. So, for example if you want to run a backup program that transfers the userprofiles to a NAS drive under the real Administrator, it may not help you. The Enable regedit fix did not work. All I want to do is run a cmd script with either xcopy or robocopy to a NAS drive. I am having similar problems with USB drive connected to the computer (not network). I have a home DLink NAS which apparently used Linux scripts to set up the NAS drive as the owner is root (Unix User\root). Prior to trying to write the CMD script I had zero problems manually addressing the NAS drive even under Win10. I have tried to change the owner of the mapped drive but Win10 won’t allow me. In UAC there is no root user. I set up my friend’s new computer and am having the same issues. He bought a WD Backup USB drive. If you go in and run the backup manually it works fine. But the backup that WD scheduled fails. Other forums suggest using Group Policy. GP is not available on Win10 Home that I can see. It is ridiculous that MS would expect non-technical users to now become network/system administrators. I have not investigated the Cloud. But I am not going to put my personal files out there. I would rather put my backup files on a USB drive and put that drive in a bank safe deposit box. Actually have not done that yet (just lazy). My friend is even less trusting of the government. We have nothing important but I don’t want anyone accessing the information without my knowledge. This limits the options I (we) have, but so be it. Fantastic! Really did save time as people have already said!